Shading Rate - I reduce from default 1 to 0.2. This will increase render times, but it will reduce the noise too. When I use depth of field effects on the camera I had to increase Pixel Samples X and Y from the default 4 to 16 to reduce the noise. When not using depth of field effects, I have left it at the default value. Are you using cameras for your renders or just the perspective view. When you add a camera you can control the focal length of the camera which effects the perspective of the photo. Are there any recommended render settings? 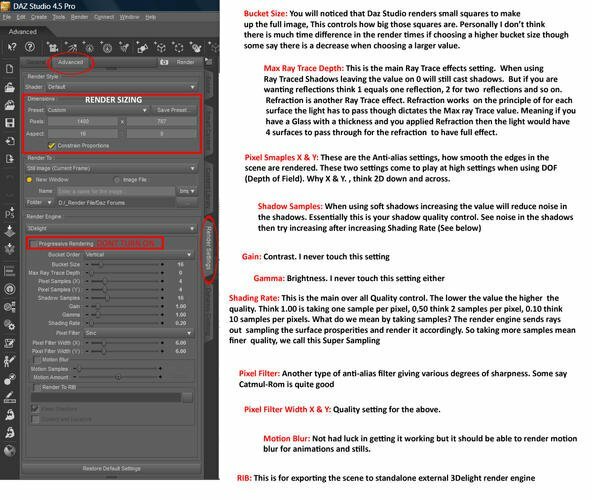 Optimising Render Settings in DAZ|Studio This is old but I still think it has some good information still. It depends upon the finished print quality, DPI that you want. If you wanted to print a 10 inch x 8 inch render at 300 DPI, then you would set the pixel dimensions to 3000 x 2400. In other words, mutlply the size (in inches) by the desired DPI. but if you are not printing then there really is no need for all that. There are loads of threads on this subject in the old and new forums I believe. DPI is a printing term, and does not apply to computers at all. DPI is pretty close to PPi, and the method I gave should work out OK. Your screen (and mine) can only display the resolution that it is set to display, and the DPI of a print file (JPG, PNG etc) wont matter in the slightest. My renders all say 96 DPI no matter what size the render is, so by reducing the size in Photoshop, the DPI will increase. Yep cheers Jimmy I get all that and got all that from the last forum....my main concern was the forumula I posted for get a Printing DPI. But recently I have seen others saying that rendering with Super Sampling Rates in the Render setings can negate this need to render huge somewhat, well not that big I should say. I haven't looked into that at all, super sampling you say, I will look at it soon and see what it does, thanks Pete. I am not saying I know for sure as I can't test anything at the moment. But a little while a go I started a project to print and been looking in to this re-sizing and I have read two sides. One say using extrememly high render settings like Shading rates down to 0.01 etc should help with keeping the qualty when printed and the one that you posted above. Also when I save a render and open it in Photoshop the image properties always read 120 DPI is this set by Daz Studio or Photoshop? I imagine it is the OS which sets the DPI size. Have a look at your JPG render, right click on the icon, click on the Details tab, and it will give you the size in pixels, and the DPI setting as well. Mine are always set to 96 DPI, but my resolution is set to 1152 x 864, so that may account for it if your resolution is higher than mine, the DPI may be higher too. The DPI of your screen doesn't really matter at all. DPI is a printing term, and means nothing in computing, only when printing an image. If you go into Photoshop or Gimp or similar, and save out a JPG image, the Properties panel (right click on the icon) will tell you what DPI the file has been saved at, which should be roughly your screen DPI. DPI only applies when printing images. In Photoshop for example, when you change the size of the image, Photoshop will tell you what the new DPI setting will be, as long as you do NOT resample the image. When rendering as explained already, you should decide what DPI you need, and what image size you want, and take it from there. If you need a DPI of 300, and an image size of 10 inches x 8 inches, then you will need to render at 3,000 x 2,400 pixels to achieve that DPI in the printed image. Why are you worried about your screen DPI? Say I had set up my scene, then go to render, I never seem to get all of what is in my screen into my render, so I assume I am setting the dimensions wrong. Is there a way to know what size your window is in Studio so you can set the render dimensions so you get all of your frame in your render? 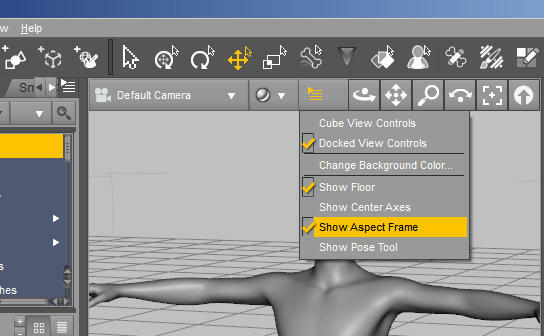 What you need to do, is check the 'Show Aspect Frame' option in the viewport menu as shown below. This will show you the area that will be rendered, depending on what your Render Settings for the Preset you have chosen. According to my graphics panel my screen resolution is 1600X900, where do I find what the DPI is...not sure where to look for thatPost 7 DPI is a printing term, and does not apply to computers at all. Nope I love folks who love learning and want to learn, though some think all the learning can be done quicker than it realy is the real world. ;) I am speaking in general terms as we all learn at different speeds and learn different aspects but many will contest that this takes time. I am not bad with knowing how to use Daz Studio for rendering and now learning more about the UI and where things are etc but when it comes to the Content Creation Tools etc forget it. This is down to not having any interest in learning that side up until recently where I have wanted to do some things so I can better help others and for a bit of fun in other programs. Also I have been teaching myself how to model for some time so time was short with doing that also. im terribly sorry to necro this old thread but im desperate and this was the only reliable source from google. i just got into rendering in daz3d and, when im done and want to render, image renders extremely dark, and does not respect the spotlights or light sources i implemented. i tried messing around with parameters (gamma being the first) but not only it didnt work, it rendered even darker. is there anyway i can render images as they appear in the viewport? no fancyprancy post-processing, motionblur, etc etc, i just want to save the image exactly as i see it. What you are seeing before you render, is the Viewport image, which uses OpenGl to display. It is not an accurate representation of lighting or even shaders. What you need to do, is a few test renders to see what the finished image will look like by using the Spot Render tool (Alt+Shift+C). You can also increase the Shading Rate to say 6.0 (the default is 1.0) and the image will render much more quickly, but with less quality, and give you a better idea of what the finished image will look like. What appears in the Viewport can differ greatly depending on the lights and shaders you are using. What lighting are you using in your Scene? sorry for the late reply. the first time i added light was distant light. i made sure to point it directly to the characters body from the front, and when i tried to render it showed as if the light was above. but it also made all the enviroments almost pitch black. thats not what i was looking for. but ive had time to mess around with rendering with different parameters,and one thing i noticed is that, everytime, skin turns resin-looking, like playstation-styled cgi characters (think final fantasy) , despite me applying a highly detailed hd skin, it loses the hd properties, no matter what i choose. also, its probably not the best place to ask but http://www.daz3d.com/back2basics-bundle-01 where is that pants with the bullet belt?? ive seen it several times in products but never the actual jeans for sale. Characters vary widely in how they respond to light, depending on their skin materials. Which character are you using? For beginners, I usually recommend placing a distant light in back, shining over the shoulder, to get a nice "rim" effect, then one on each side, and one from the front. Start with about 25% brightness, and don't use white. Use either a bluish-gray, a pinkish mauve, or a slight whitish yellow. Then shut each light off to test each one, increasing the brightness more on some than others so you get some nice shadows. But again, it depends on what character you're using. And your render settings, as mentioned before. The distant light shows in the Viewport as a set of three arrows, and no matter where it is in the scene, the amount of light is the same. The arrows merely tell you the direction the light is coming from. It represents the sun so the distance is not a factor, but the direction is. If you have a distant light pointing directly at a character, the floor may not show up correctly, since it has no direct light falling on it. You can always put in a second distant light pointing directly downwards at the floor, and adjust the parameter settings to reduce the intensity if needed. The appearance of skin will change depending on the lighting. Good lighting is vital to produce really good results. If you post an image of the problems you are having with the HD skins, we may be able to help more, but once again, lighting is vital.